Q1: Can you tell us about this project that has applied for the 2018 Miss.Africa Seed Fund Awards? INTELLECT-Team at Laboratory of Technologies for Smart Systems is located in Digital Research Center of SFAX, TUNISIA. Among our research activities we focus on the effective deployment of IoT systems for diverse applications. Our project that we applied for the 2018 Miss.Africa Seed Fund Awards is called: The 1st IoT Joint Program to African Young Women. Women researchers at our research team are glad to be in the short list to receive this award, we are grateful to the Miss.Africa Seed Fund team for believing in our project that will be an opportunity for networking between Tunisian Women and Young African women who are interested in technology careers. Joint participants (from high schools, under-graduated university, senior researchers from my research laboratory and experienced IoT expert from Sfax University). Joint School and Hackathon : This IoT school aims to get girls interested and aware of the opportunities that are available in the future in the IoT and Smart Systems fields. The IoT hackathon which is joint to the IoT school will stimulate the innovation inside the young participants. Four days of tinkering, coding and accelerated learning related to IoT. Furthermore, this event will promote gender equality in scientific programs and inspire more girls to pursue careers in Technology. Q2. What are some of the challenges you are trying to address with your project? The main challenges that we are trying to address are related to the sustainability and scalability of the event so we try to get funds for next editions (2019, 2020…). We hope that this event will be running each year and will attract more and participants. Another challenge for the next edition is to attract international volunteer expert women speakers on IoT for the next edition. Another challenge is the integration between different participants. Q3. How are you bringing innovative approaches to these problems? For both scalability and sustainability of the event we are looking for national and international funds to support us. Therefore, for future and based on the success of the first edition that will running in 2018 we believe that we will attract more stakeholders to support young women. The innovative concepts of our hackathon will promote the integration between participants. Q4. How does it feel to gain international recognition for your work? IoTs and Smart systems are among the hot ICT research topics. The Internet of Things marketplace is moving fast, with considerable innovations. To keep up, young women researchers should consider IoT events to stay within the sphere of the Internet of Things (IoT). In our event the participants will learn and innovate which is a particularity for our event. Furthermore, we grant accommodation for African participants. Besides that our previous experiences related events organization such as IoT Hackathons and events dedicated to inspire young girls to technology (such as Girls In ICT day 2017) are the keys to get the trust and international recognition. Q5. Can you explain why skills for women in tech is so important? Technology is a hot sector, and it’s stimulating to see more women getting involved in order to reach gender equality at the core of the science and technology. Technologies grow rapidly and for each country to follow this evolution, it should consolidate the involvement of men and women in the technology fields. Based on my experience as a researcher supervisor, I believe that women get huge skills related to technology and they could innovate and they could give added values to technology. These days, there is constantly something new coming out of the tech industry and having a great on our daily life. It seems like there is always a new gadget or app based IoT creating buzz. For this reason, young women should switch their interest and attention to technology domains. Q6. What in your opinion should be done to address the digital skills gap in Africa? Bridging the digital gender gap is a critical step toward the future of Africa. In my opinion, education and higher education are the first key to reshape our continent. Millions of African women and girls should get access to higher education and to technology. Young girls should be inspired to technology through listening and to women leadership and learning about women success stories. The stakeholders in our continent as well as researchers should organize more events inspiring girls to technology. Our event is one example that inspire girls and women to technology. Special funds should be allowed to events inspiring women to STEM. Prof. Lamia Chaari Fourati, INTELLECT-Team at Laboratory of Technologies for Smart Systems is located in Digital Research Center of SFAX, TUNISIA. 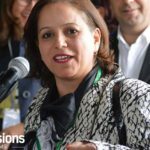 Lamia CHAARI FOURATI is an associate professor at Computer Science and Multimedia Higher Institute She focused her research activities on conception and validation of new protocols and mechanisms for emerging networks technologies. Her research activities are related to digital telecommunication networks. She focused her research on applications that impact positively our society through the conception of innovative protocols and mechanisms for health monitoring, remote systems monitoring, the environmental control as well as energy-saving approaches. Her scientific publications have met the interest of the scientific community and her work has been published in a very good journal and conferences. Prof. Lamia CHAARI FOURATI is the laureate for the Kwame Nkrumah Regional Awards for women 2016 (North Africa Region).